UN Secretary-General Ban Ki-moon voices concern after Saudi-led coalition renews airstrikes on Houthis. UN Secretary-General Ban Ki-moon voiced concern on Wednesday about the renewal of airstrikes in Yemen by a Saudi-led coalition, saying he hoped the fighting would cease quickly. "When I read the report that fighting was resumed I was very much concerned about that," Ban told reporters, according to the Reuters news agency. 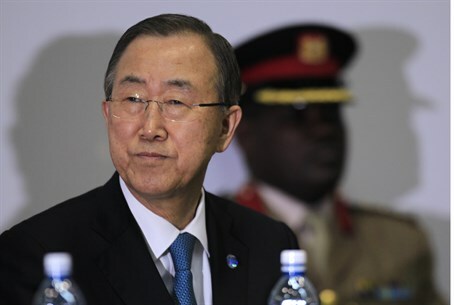 "I sincerely hope there will be an end of fighting as soon as possible," added the UN chief. Saudi Arabia announced on Tuesday that it would end almost a month of air strikes against the Iranian-allied Houthis but resumed operations on Wednesday. Last week Ban called for an immediate ceasefire by all parties in Yemen. Saudi Arabia’s ambassador to the United States said Wednesday that his country’s military will continue to use force to stop the Iranian-backed Houthi rebels from making advances in Yemen. "When the Houthis or their allies make aggressive moves there will be a response. The decision to calm matters now rests entirely with them," the ambassador, Adel al-Jubeir, told reporters. "Operation Decisive Storm" was launched on March 26, and included a total of 2,415 airstrikes. In announcing the end of the operation on Tuesday, a Saudi defense ministry statement said the operation ha "succeeded," and has destroyed ballistic missiles belong to the Houthis and militias loyal to deposed President Ali Abdullah Saleh. The airstrike campaign was launched after the Houthis toppled the government and seized control of the capital city of Sanaa in January, putting President Abdrabbuh Mansour Hadi under house arrest. He later escaped to the strategic southern port city of Aden in February, but he fled the country in late March when the Houthis began marching on Aden, before capturing central parts of the city. It is widely assessed that the Saudi-led strikes have largely failed in halting the Houthi advance to the south. If they succeed in fully capturing Aden, the Iran-backed rebels will have control of access to the Red Sea, and ultimately to Israel's southern port of Eilat.